The year is 1941. The Axis war machine appears invincible. The Balkans have fallen. Pearl Harbour has been attacked, and Rommel has the British on the run in North Africa. At this explosive point in history, the Axis & Allies Anniversary Edition challenges you and your opponents to decide the outcome of World War II. As one of the world powers struggling for supremacy in 1941, you must spearhead your nation's military drive. 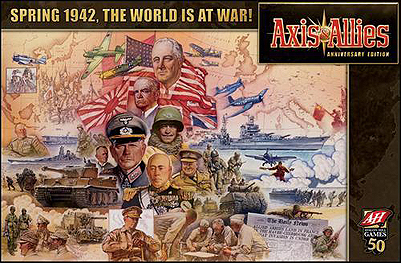 Axis & Allies celebrates the 50th anniversary of Avalon Hill with this deluxe edition, designed and developed by Larry Harris, the original creator of Axis and Allies. This new edition includes an all-new, huge 24" by 46" game board, new cruiser units, and the debut of Italy as the third Axis nation.